If you read my last post, you would know about my little shipping debacle. This time around, my package from Born Pretty Store came within 2 weeks! That's pretty fast considering it shipped from Hong Kong. I decided to try out their "3mm Colorful Half Pearls" because the variety of colours stood out to me. I try to imagine the nail art I can do before I settle on a product and I found that this could be very versatile. This circular nail art box comes with 12 different coloured half pearl. They come in light brown, white, black, red, peach, light green, light pink, dark blue, baby blue, orange, purple, and hot pink. I was really eager to use it so that is why some sections doesn't look as full as others. You can get this in the Born Pretty Store for $4.74. As always, the more quantities you buy, the lower the cost. On top of that you can use my code NVL91 to get 10% off! Like I said before, these half pearl are very versatile and you can use as much or as little as you want. Since it comes with so many colours, there are thousands of combinations you can put together. Since these are rather "heavy" decorations, you need to use at least two layers of clear coats to really glue these pearls on. Below is a nail art I came up with using these pearls. 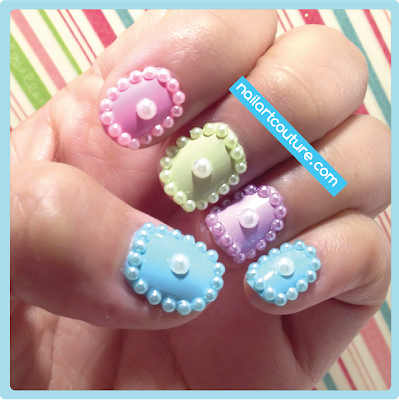 I went with pastel colors that matched the pearls to create a monochromatic nail art. The larger pearls come from another nail art package that I will review next. Born Pretty "3mm Colorful Half Pearl"
Paint your in any color and allow it dry completely. Using a dotter (or end of a bobby pin), dip it in clear polish and dot the spot where you want to place the half pearl. The half pearl should be the same color as the polish your chose. Dip your dotter in clear polish again and use it to pick up a pearl. Gently place it on top of the clear coat dot. Repeat this process until you have complete the border of your nail. Using the same process as above, do the same with a large white pearl. Place the pearl in the center of your nail. Repeat this process with your other nails. You can create a multi-colour one like me or stick with one color. 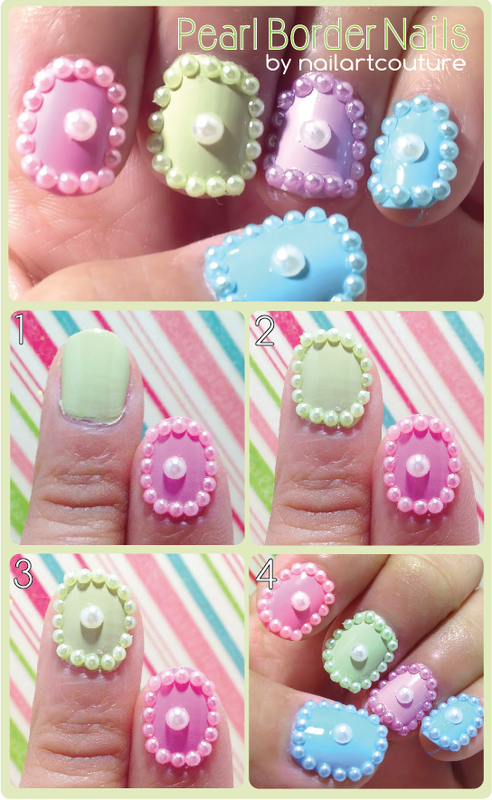 Coat your nails with 2 layers of top coat to seal in the pearls. I think these pearls are more suitable as accents because I believe that it would make it last signifantly longer. I used quite a lot of pearls for this nail art, so I needed more clear coat to glue these little suckers on. This nail art in particular peeled off quite easily due to the thick layer of clear coat that was applied, but at least it looked pretty cute while it lasted. Below is another version I did for my friend Marissa, which lasted more than two days. So how long they last depends on how you use the pearls. Anyways, I hope you enjoyed this little review. If you're new to nail art and you don't want to spend too much money on nail art supplies, then this is a website for you! The sell at wholesale prices so every thing is definately afforadable. You can actually get quite a lot of $20! They have 99 cent flash sale all the time. Again, you can use my discount code NVL91 ﻿for an extra 10% off! I love both manicures, but I think I would be losing pearls left right center! Great post! I'm your new follower! I hope to see you in my blog sometimes. Thanks! :) Kisses from VV!! I am currently running a giveaway on my blog if you want tot check it out?..